Common Council member Nick Sacchinelli (D-At Large), right, introduces Mayor Harry Rilling’s proposed reorganization for a vote Tuesday in City Hall, as Director of Personnel and Labor Relations Ray Burney, left, prepares to answer questions. None were asked. NORWALK, Conn. — Norwalk’s governmental administrative structure has been realigned. Two new department heads and a Chief of Staff position will be created, and some reporting lines will change as a result of Common Council’s 10-3 vote in favor of Mayor Harry Rilling’s reorganization of Norwalk government. The Council passed every change requested by Rilling in June, except for the creation of a Community Services division. Passage of the reorganization was anti-climatic. Only one opponent, former Council member Rich Bonenfant, voiced the same concerns he’s been expressing for months during public comment. Two commenters spoke in favor, including Jim Clark who assailed what he described as “Do it right or not at all” sentiments expressed by some critics of the reorg. Four Council members repeated sentiments they’ve already stated, for and against. The reorganization will result in enhanced interdepartmental communication and allow for improved responsiveness and greater accountability, Council member Nick Sacchinelli (D-At Large) said. The vote created a Chief of Economic and Community Development, who will oversee code enforcement, Planning and Zoning, business development and tourism, and transportation, mobility and parking. This in effect creates a “mini-neighborhood improvement department,” in addition to the new department of transportation, mobility and parking, King said. Also created was a Chief of Operations and Public Works, who will oversee the Director of Recreation and Parks, the Buildings and Facilities Coordinator and the Administrative Services Manager. Superintendent of Parks Ken Hughes will be promoted to Superintendent of Public Property and Parks, and he will oversee all public property, removing some responsibilities from the Department of Public Works, King said. Hughes will work under the Director of Recreation and Parks, who will also oversee a Superintendent of Recreation. The proposal for a Chief of Community Services position, which Council did not pass, was criticized by the Fair Housing Advisory Commission and the Norwalk Branch NAACP, because it sought to combine the Fair Rent and Fair Housing departments. Opponents said the change would be in violation of the 1986 federal consent decree that created Norwalk’s Fair Housing Office. Documents dated Aug. 9 show $277,409 in additional costs arising from the reorg, mostly from new positions created plus a $36,000 raise for King. The costs are offset by $96,260 in savings, for a net cost of $181,140. City officials previously said that they believe additional savings will be found after the reorg’s implementation. The public will be able to track progress on the Mayor’s dashboard, comparing goals and objectives to outcomes, he said. “The Bike/Walk Commission supports the creation of an Economic and Community Development Department and the position of Transportation Planner,” Bike/Walk Commission Chairwoman Nancy Rosett said to the Council. She mentioned the “Complete Streets” initiative tasked to the Commission when it was formed. Bonenfant echoed prior criticisms that the the reorganization was simply a vehicle to give King a pay raise. “I’ve already mentioned this: what a great country it is that you come to work and work on your own job title, your own salary and your own powers,” he said. “‘Do it right or not at all,’” Clark said, repeating a local catch phrase. The reorganization will allow government to serve citizens better, Clark said. He believes there will be benefits from moving the neighborhood improvement coordinator position from the Redevelopment Agency to the new Economic and Community Development department, and from adding a part-time blight enforcement officer. “This will make our cleanup initiatives and our neighborhood blight enforcement more effective,” Clark said. “This went through four committees, it was vetted a great deal over a course of many months. We have come to a consensus,” Sacchinelli said, introducing the item. 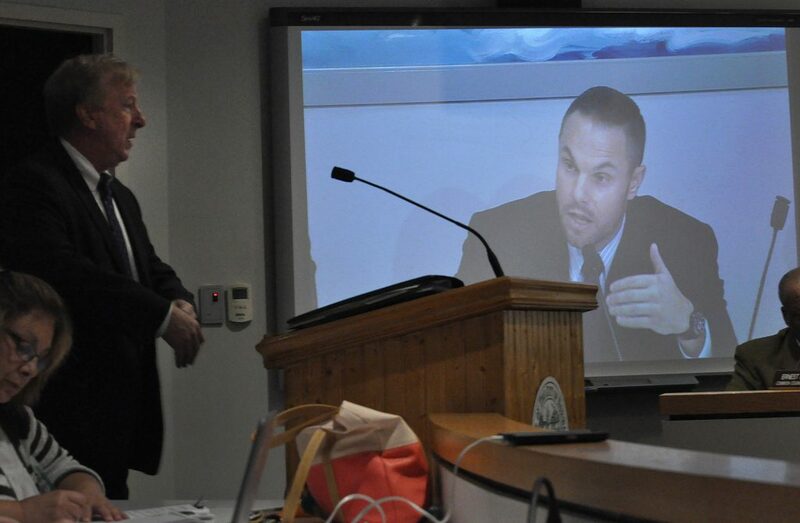 Sacchinelli said he is excited about steps to come, the opportunity to align Information Technology (IT) infrastructure and add the dashboard Rilling has mentioned. “It’s funny sometimes that when you’re evaluating something some people paint people that may not want to go along with things or have objections about the way things are done, as … not wanting to move forward, not wanting change,” Doug Hempstead (R-District D) said. He’s voted for change in his long career as a Council member, he said. But “change is more than boxes and lines on a flow chart … Change is about changing the way you do things and your delivering of services.” There’s no data on how this reorganization will benefit Norwalk, he said. “If you’re going to do a reorganization, you owe it to the citizens and the employees of government, to follow a process rather than winging it. I really feel right now we have done more of a winging, that, too many ‘report tos,’ need to reduce that, but to really make the best decisions you have to keep your employees involved and engaged and the public engaged, get more value out of the changes we are doing,” Hempstead said. The Finance Committee reviewed the proposals, Finance Committee Chairman Greg Burnett (D-At Large) said. “The reorganization/realignment provides an infrastructure for more effective efficient and streamlined approach towards managing the operations and business of our City,” he said. “It would be very easy to sit on hands and allow the status quo to remain,” and “a great deal of work” went into the reorg, but “my concern is it’s all being implemented simultaneously,” Michael Corsello (D-At Large) said. After that brief conversation, the Council voted. Ernie Dumas (D-District B), Hempstead and Corsello voted no. Travis Simms (D-District B) and Barbara Smyth (D-At Large) were absent, making the vote 11-2-0. King will get a $36,000 a year raise as she becomes Chief of Staff instead of Assistant to the Mayor. Rilling and Council members were behind closed doors as King and Burney spoke to NancyOnNorwalk, engaged in an executive session about an ongoing lawsuit. King said she’s already been referring to herself as Chief of Staff because when she calls the governor’s office to represent Rilling and the City, for instance, saying “mayor’s assistant” gives people the impression that she’s an executive secretary and doesn’t convey gravitas. “Chief of Staff” reflects the work King has been doing, Burney said. Rilling said recently that he works in tandem with King, that they are really a team. So does the reorganization mean that desks will be moved around City Hall? Rilling et al find it so easy to spend other people’s (taxpayers) money and not be held to account. A micro, city level example of why Connecticut is going broke. Hemstead: “Change is about changing the way you do things and your delivering of services.” There’s no data on how this reorganization will benefit Norwalk, he said. Thank you Mssrs. Corsello, Dumas and Hempstead. Three men, with different political views – but with a shared honor of voting their conscious and what’s right for residents. One has to hand it to this mayor, he’s managed to unite the political spectrum in Norwalk with the repeatedly blatant, incompetent cronyism unabashedly on display. The combination of five years of broken promises to address P&Z, combined with petty, vindictiveness on Wall Street, won’t be easily forgotten this next budget cycle when the city is strapped for cash. Spending taxpayer money like this, with no quantifiable metrics or strategic plan will be remembered, along with the financial squandering of his years in office. Congratulations ! We Now have a New unelected New Mayor ! Thank you to the three wises men who did the right thing ! Doug has never voted for change. You want to know why the schools don’t have air conditioning….or haven’t been updated in years…Doug is part of the school that held this back for years and years and yet more years. Lawsuits, tax credits, crony deals and years and years and years 😆 of poor planning have resulted in the budget gap between the city and school system. However, now that we’ve secured our ‘new mayor’ and fewer reports for our ‘old mayor’ – all will be well! This is interesting: ““The best way to explain it is the Council has approved a realignment of city staff to tighten the mayor’s span of control,” King said afterwards. “So that rather than having 19 departments reporting to him, he’ll have closer to nine.” Someone explain to me how having fewer direct reports will give the Mayor greater control? Call me crazy but this smells a lot like GM in the 80s and 90s – fat not flat, with lots of places to hide. This is encouraging: “The public will be able to track progress on the Mayor’s dashboard, comparing goals and objectives to outcomes, he said.” NON and Mayor King – can we get the rough draft of what all the metrics will be on the dashboard? Surely it sounds like someone took my and others suggestion about KPIs – Key Performance Indicators and SMART objectives are clear – all of which were vetted. Graphics/user interface aside, at a minimum, there is a bulleted list of what will be on the dashboard, how it will be measured, how often, right? Or like my GM analogy, will the dashboard be lit like a Christmas tree with many red lights warning of danger. I doubt it. Lastly, how on earth does a title change get what I think is about a 25-30% bump in salary? Anyone in the private sector ever hear of that? HR professionals – what say you on the 2nd mayor getting this massive increase in pay? Looking forward to that dashboard, until then please don’t crash the taxpayer funded car. You know why our schools don’t have air conditioning Nora, because my tax dollars are spent on overpaid city government Nora that’s why. Take your head out of the sand so you can see what is going on in front of you; $277,409 a year plus benefits and pensions in additional costs arising from the reorg, mostly from new positions and a $36,000 raise for mayor King who was never on the ballot for me not to elect. Is anyone supersized that the puppets in the common council put this through, I am not I said it would go through months ago. VOTE every YES council member out that allowed this to happen with little to no accountability, checks, and measures. This is a waste of tax payer money and the home owning taxpayers spoke loud and clear that we did not want this jammed down our throats. It is to late to save this city however we must vote out the people who ruined it starting from our now deputy mayor Rilling, to our new never elected mayor King, and the council yes voters that allowed this to happen wasting the home owning tax payers money. Do something about our declining property values instead of spending our money to line the pockets in city hall management and remember it is the taxpayers money you are giving away not your money and not money you earned. Yet another embarrassing example of electing Mayors and Council men lacking not only business management experience but knowledge of basic management skills. Norwalk’s “reputation” as a mismanaged City can only grow in the County’s business community. A City managed by a former Police Chief is making history in CT. Giving a current assistant to the Mayor (not a traditional City job) a $36k pay hike to a newly created job without meeting the usual qualificaitons and not dong a Prof. Search to secure Top Talent just demonstrates how our Mayor fails to understand the basics of competent management. Sad day for Norwalk. A once proud City is mismanage to an extent rarely seen even in CT. I wonder how/if this reorg will affect the city government’s ability to fix any of the problems. The Lajoie F&G hearing was a pitiful example of the government’s hopeless paralysis when confronted with clearly egregious perpetual offenses. F&G’s lawyer ran the show while all others appeared helpless to remedy an utterly intolerable situation. The schools lack money because we give our tax revenue to residential developers, and unless something changes, we’ll soon be doing more of that in the proposed Innovation Disaster. @Bob Welsh in response to @Kevin Kane And apart from the elected officials, will there be accountability along with SMART goals and performance indicators? May we see a job description for Ms. King, current and future? I’m sure many would like to understand how a hefty $36k raise is justified. And the answer to this question, as self-serving as it might be, is not “well, responsibilities will be fluid”. There must be a job description. All competent and functioning management teams have them. if one read this in A Book,they would think they are reading a fairy tale,only we are paying dearly for this tale. WE DO NOT NEED TWO MAYORS. LETS PUT MS. KING ON THE BALLOT AND SEE HOW SHE FARES. ENOUGH IS ENOUGH,TAXPAYERS NEED TO FORM A GROUP AND REFUSE TO PAY TAXES. The qualifications for King’s new position sounds like this person will run the whole operation- as a city manager-. Why then do we bother operating with the effort and expense of electing a mayor? Time to look at everything concerning running a city. No one would give their financial planning to such a group of well-meaning citizens as our Common Council that Norwalk has done. Time to get real about local government. And look at our state system. Our School Supt, charged with overseeing 2/3rd the City budget, and an unquestioned professional, manages without a “Chief of Staff”. As do to the best of my knowledge every hospital, university and major non-profit in CT.
What’s puzzling is why after spending more monies on a Reorg Plan (reducing spending is the standard here) our Mayor wants a zero increase in our BOE budget but not promising same at City Hall. Suggests some “management issues” at City Hall. Actually Ms King WAS on the ballot once, and WASN’T elected (to the Common Council At-Large in 2015). Even back then she was advocating for a Chief of Staff position for the Mayor and more staff. This job was sold to the public and the BET and the Common Council as an “assistant”, to help the Mayor, not as a chief of staff. Bear in mind that if Mayor Rilling wanted to give his assistant more money, he could have simply continued to decline the Mayor’s raise, as he did in his first year of office and earmarked it for King. The Mayor’s raise was sold to the Common Council as a measure of respect to make more than the people who report to him, because he takes the hits and makes the decisions. By that logic, with all these “cabinet-level” raises, it won’t be long before the City is gifting him with even more money. But he chose to take the raise, even as the budget discussions began to give him help in the form of an assistant, because it was a lot of work to have so many people reporting to him. Now he is getting more money, more help, AND fewer direct reports. Everyone reporting in to him is getting more money, and there isn’t a stitch of narrative that explains how this will be more efficient from the perspective of the people who don’t work in City Hall. There are a lot of people saying that Ms King is not qualified. SHE IS. She is MORE than qualified to run the city. Unfortunately, some of us don’t care for her philosophy of governing, and would have preferred the right to weigh in on who will be running the City. This reorg was on the drawing board well before the election last November. Perhaps it would have been nice, at the time we were filling out our ballots, if the Mayor had admitted that after years in the top seat, he still wasn’t equipped to run the City.